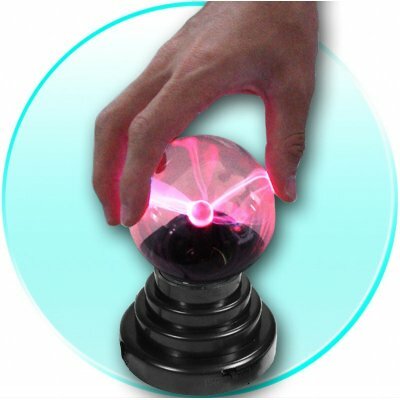 Successfully Added USB Plasma Ball - 3.5 Inch Electric Globe to your Shopping Cart. Plasma Ball powered directly from a computer USB port. This is a fun little gadget to have on your desktop for those boring times when you need a little distraction. Just plug it in, turn it on, and watch the electricity flow in the globe. For added fun, run your fingers along the globe, and watch as lightning jumps out towards it. Have fun at work, and liven up your desk with this wholesale priced USB Plasma Ball, direct from the factory to you! on 2009-09-16 07:22:05 Great price for a fancy plasma ball! I love this USB powered plasma ball. It's the perfect cool gift for that geek in your life! It was also bigger than I expected - not a tiny cheap thing. It works suprisingly well off the USB port. Bright lite, it is a little faint, but very neat in the dark. on 2007-10-29 11:46:59 a must..
i wasn't sure about the quality so i ordered only two but now i regret it.. it's a very nice plasma sphere to look at.. a great present since it's very very cheap, you can buy for your friends/family.. they will love it..